Today at its Tech World Transform commercial summit, Lenovo (HKSE: 992) (ADR: LNVGY) announced agile and reliable PC offerings for business customers that address the evolution of the workforce and workplace. Today at its Tech World Transform commercial summit, Lenovo (HKSE: 992) (ADR: LNVGY) announced agile and reliable PC offerings for business customers that address the evolution of the workforce and workplace. 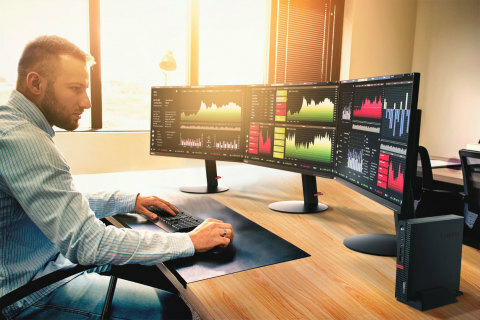 The ThinkStation P320 Tiny offers Independent Software Vendor (ISV) certification to ensure customers' most critical applications run reliably in an incredibly small one liter form factor. Lenovo's PC as a Service (PCaaS) offering provides a fully-managed, fixed monthly cost subscription model combining hardware and services into a single solution. Designed to eliminate the burden of buying, deploying and managing computing assets, PCaaS increases product lifecycle efficiency and reduce overall total cost of ownership. Physical workspaces are becoming valuable real-estate, so it's necessary for workstations to be as adaptable as they are powerful in any setting. The ThinkStation P320 Tiny makes full use of tight spaces and delivers on the power expected from a workstation. Easy to set up and compatible with Lenovo's ThinkCentre Tiny accessories, the P320 Tiny harnesses the power of the latest Intel® Core i processors and relies on NVIDIA® Quadro® Graphics to achieve ISV certification to deliver the performance demanded across a range of professional applications. Whether developing the latest innovative products, designing a state-of-the-art skyscraper or educating future entrepreneurs, the P320 Tiny offers big business-ready power in the smallest of packages, so workspaces perform at their best, even in the most finite spaces. As new generations of tech-savvy employees prioritize device flexibility and work mobility, organizations are adapting the way they approach and manage workplace technology. The shift towards agile IT, Choose Your Own Device and multi-device synergy is shaping our personalized computing future. PC as a Service (PCaaS) responds to this change by simplifying the financing, deployment, management and disposal process of computing assets by packaging it into a single, configurable solution with a fixed monthly cost. Businesses can select tablets, laptops, desktops, workstations or software and services, giving end users greater device choice and allowing capital investment to grow with the business. "The workspace is evolving and so is our PCSD business. The Commercial Business Segment has been created to service our customers through innovative solutions & tools that will help them harness the intelligence transformation," said Christian Teismann, senior vice president & GM, Commercial Business Segment, PCSD. "ThinkStation P320 Tiny and PCaaS are just two solutions within our tool kit we are launching to help IT organizations transform. PCs will continue to be the integral component of the personalized computing future." ThinkStation P320 Tiny is available now at $799Lenovo PC as a Service is available now. To find out more and contact a Lenovo PCaaS expert, click here. For more information on news announced at Tech World Transform, please visit www.news.lenovo.com/TRANSFORM2017 or follow @ Lenovo for live updates on June 20, 2017, using #LenovoTRANSFORM. Lenovo (HKSE: 992) (ADR: LNVGY) is a US$43 billion global Fortune 500 company and a leader in providing innovative consumer, commercial, and enterprise technology. Our portfolio of high-quality, secure products and services covers PCs (including the legendary Think and multimode Yoga brands), workstations, servers, storage, smart TVs and a family of mobile products like smartphones (including the Motorola brand), tablets and apps. Join us on LinkedIn , follow us on Facebook or Twitter ( @Lenovo) or visit us at http://www.lenovo.com/.